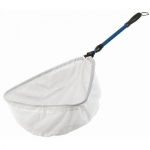 Laguna Collapsible Pond & Skimmer Net This net, with it's unique triangular head, allows easy access to round corners and is collapsible for easy storage. Head size is approx. 18" x 16", the handle is telescoping to 32".